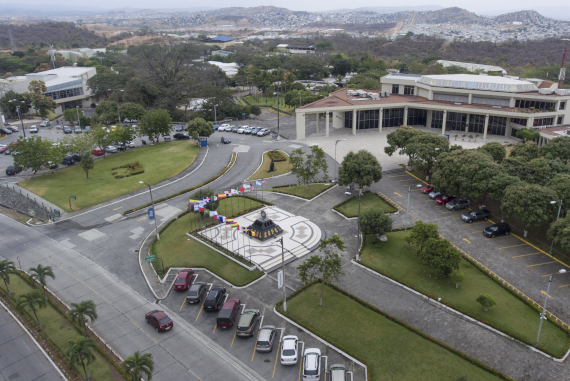 The Escuela Superior Politécnica del Litoral, ESPOL, is one the most iconic universities in Ecuador with 60 years of experience. ESPOL is an institution devoted to developing scientific research in different areas. Its history testifies to its commitment to quality and innovation, both in development and in the academic sphere. The university main research areas are agriculture, animal production, climate, environment, education, communication, alternative and renewable energy, enviromental management and industrial technology. ESPOL offers several investigation centers in order to help companies establish themselves at ZEDE del Litoral. Some of them are listed below. The CTI has established 4 research programs that conduct investigations among several impact lines of Information Computer Tecnology - ICT. These programs develop real projects that combine new technologies, multi-disciplinary participation and the different human dimensions of technology. CENAIM is a marine and aquaculture investigation center. CENAIM's main focus is on the study of shrimp, mostly on health and disease diagnostics and control. The research done at CIBE covers areas like plant tissue culture, molecular biology of plants and microorganism, genetic improvement of plant species, adaptation of banana varieties, as well as the study and control of diseases of different crops such as banana, banana, cocoa and coffee, with special emphasis on black Sigatoka, Monilia, and virosis in general. Organic amendments are studied and characterized in production systems friendly to the environment. It is an R + D + i center that carries out scientific and technological research aimed at solving specific problems within its fields of application in: agriculture, manufacturing, transport, telecommunications and intelligent constructions; developing systems that integrate hardware and software. The CADS focuses on the integral management of water resources, through the development of decision-making support tools for the management of drainage basins. The objective of this center is research, innovation and development in science and engineering applied to optimal use of renewable natural resources, with a view to satisfying the needs of the country in the development of the energy sector, convertiing electricity into a source for production and welfare to improve the quality of life of ecuadorian people.